1 Tuner + 1 or more non-Tuner Synchro Monsters Once per turn, during either player’s turn, when another monster’s effect is activated: You can negate the activation, and if you do, destroy that monster, and if you do that, this card gains ATK equal to the destroyed monster’s original ATK until the end of this turn. If this card battles a Level 5 or higher monster your opponent controls, during damage calculation: This card gains ATK equal to the current ATK of the opponent’s monster it is battling during that damage calculation only. Monsters requiring Synchros as part of the Synchro Summon weren’t very practical for meta decks until Crystal Wing Synchro Dragon appeared. Great stats backing it, a Tuner and 1 or more non-Tuner Synchro Monsters gave you this beatstick of a boss monster. You may need to perform two Synchros to get this on the field, but it is worth it. One effect negation and destruction per turn is fantastic. CWSD forces your opponent to use at least one monster to get through the negation ability. The attack gain from the negation and destruction of the effect monster makes its already impressive 3000ATK even harder to get over. While you may not run into many Level 5 or higher monsters nowadays with Xyz and Links dominating the game, more attack gain can put your opponent in-between a rock and a hard place. The gain will match their monsters ATK, and you’ll be doing at minimum 3000LP damage. That gain only lasts until the damage calculation is done, and the first gain lasts until the end of the turn, but that can be enough to finish your opponent. The negation is a Quick Effect, so any effect is in play to be negated. Glow-Up Bulb and Ancient Fairy Dragon is probably one of the best ways to get this monster on the field, after gaining the benefits of those two monsters. Crystal Wing Synchro Dragon severed as a reminder that Synchros were still pretty powerful and worth a spot in the Extra Deck. There were going to be a few more modern Synchros on here obviously that have been released since 5D’s ended because there are so many really good post 5D’s Synchros, most of them coming in the Arc-V era. Today, we will look at one of the Arc-V Synchros, originally released in Shining Victories as the Cover Card, we have Crystal Wing Synchro Dragon. Crystal Wing is a Level 8 WIND Dragon Synchro with 3000 ATK and 2500 DEF requiring one Tuner and one or more non-Tuner Synchro monsters. Summoning requirements are still generic, though the non-Tuner has to be a Synchro, there are several lower level non-Tuner Synchros you can use. Stats are great, WIND isn’t too good, but Dragon is outstanding. Once per turn, during either player’s turn, when another monster activates its effect, you can negate that activation and destroy that monster and if you do destroy it, Crystal Wing gains ATK equal to the ATK that monster had until the end of the turn. Monster negation might be the best negation in the game right now. Crystal Wing isn’t limited on what it can negate either unlike Clear Wing, plus a potential attack boost is nice. Also, when Crystal Wing battles a Level 5 or higher monster, it gains ATK equal to the ATK of the Level 5 or higher monster. This can easily get over any big threat that isn’t an XYZ or Link, but Crystal Wing can stop the effects of those monsters to compensate since it’ll mostly be Utopia the Lightning that threatens this in battle and they have to bait this out first to use an effect to get rid of Crystal Wing. If your opponent does the one card Windwitch combo into this, it’ll have protection from destruction effects as well, which makes this more of a pain to deal with. Crystal Wing is a great Synchro that hasn’t really been affected much by powercreep, it is still really good. Art: 5/5 Crystal Wing is so beautiful. 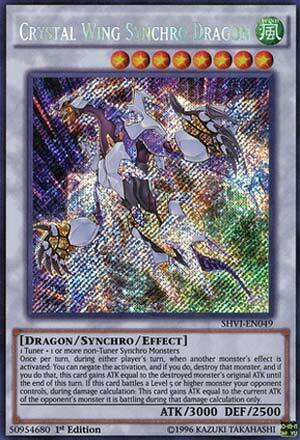 Clear Wing Synchro Dragon, definitely one of the more beautiful pictures in Yugioh. Level 8, Dragon, 3000 attack, Wind (Dragon and Wind give it synergy with Stardust Dragon) and a slightly different Synchro requirement as a Tuner and one or more non-Tuner Synchro Monsters. He negates, he destroys, he gets stronger on top of his 3000 attack to start. It’s lovely too this isn’t one of those terrible effects that spout ‘the first Monster effect’ so you have control over when to use the negation, and it balances itself out being every turn, but once a turn. While still being a gem that you can use on the turn of either player. It has the same, secondary effect of gaining attack when battling a Level 5 or higher Monster, but it still can be welcome, and a great asset for heavy Damage, and more than once, just like with the built in negation and destruction. It’s vulnerable to Magic and Trap cards of course, but very incredible the power in here. This effect is obviously useless against XYZ and Link, but the negation/destruction is just as good against them.